In Gaza, there's a shortage of zebras. 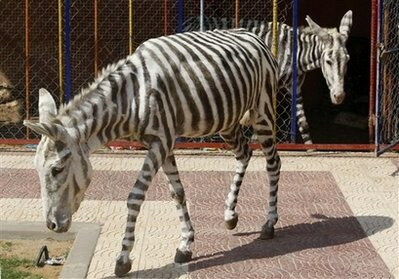 Donkeys get dye-job, take on zebra role:Two white donkeys dyed with black stripes delighted Palestinian kids at a small Gaza zoo on Thursday who had never seen a zebra in the flesh. Nidal Barghouthi, whose father owns the Marah Land zoo, said the two female donkeys were striped using masking tape and women's hair dye, applied with a paint-brush.